The ZERO 10 is a full-sized workhorse of an electric scooter. It comes with integrated shock absorbers in the front steering column and a set of sophisticated and beautifully designed rear twin hydraulic suspension. With 10-inch pneumatic wheels and front and rear disc brakes, it offers excellent ride quality and safety. The ZERO 10 escooter out-performs most other scooters of a similar size with its powerful 800W (1600W peak) motor. All these at a very compelling price. The ZERO 10 is an excellent alternative to the Speedway 4 and a top choice for a full-sized touring or commuting electric scooter. 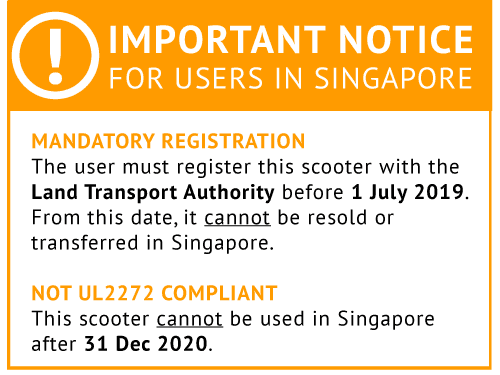 This scooter is Singapore compliant. Front and rear disc brakes for effective stopping power. Built-in headlight and deck light complies with regulations for riding at night. Twin rear shock absorbers for smooth riding, rear deck lights are built-in.